What happens when a kid from Brooklyn and a Denmark native get together and decide they can bring Royal Danish Yacht Club caliber sail racing and team building to Manhattan? So far, two and a half years of pressure, heartbreak, immense learning, and adventure. It started in January 2011 when my business partner Simon Karstoft Jensen and I were recovering from ringing in the New Year in New York. Simon had been working for the Royal Danish Sailing Academy – the Royal Danish Yacht Club’s corporate team building offshoot – for a few years. He was convinced that the Royal Danish model would work wonders in New York – great sailing, great teambuilding. I mentioned that, in my humble opinion, while the sailing available in Manhattan was great, there was nothing that would really get the blood going in the veins of an experienced sailor, driven athlete, or powerful businessperson. From here, pen was put to paper and the business plan started to take shape. Six months later we had a sixty-page document outlining our utopian vision. We decided on a boat – the Farr 30. The boat has a large cockpit, it is fast and sporty, it is magnificent in pictures, it would gallop through New York harbor’s chop and current, it is small enough that clients could sail the boat and have a hand in winning, and it would attract the people we want! We kept working on the business plan through the summer, meeting with everyone we could to get input from and we continued to streamline our concept. At this point it was August and I had just arrived at the last page of Herman Melville’s semi-autobiographical novel White Jacket. As the protagonist steps onto the wharf after his three-year internment in the American Navy aboard the Neversink, he is set free. When he looks up, he sees the halcyons singing. Here we did a quick switch and decided that the Neversink represented the corporate jungle and the wharf was a great sailing experience with us. The name would be Halcyon Sailing. We were able to meet with the principal of a venture capital firm that specializes in tech, but was nonetheless eager to hear our pitch. Maybe it was that he had just heard another pitch for the thirteenth version of delivery.com, but after a few days I got a call saying that the boss thought it was a good idea and that we should make it our full focus. In January 2013 we had raised the funds and got a space for out boats on the Hudson River. I quit my job, Simon flew over from Denmark, and we hit it. We needed three Farr 30s, tender, staff, and a landside space – all by May 1. No problem. Off to California we went. A week and 2,000 miles on a rental car later, we flew back, followed by two Farr 30s. We also bought a boat in Canada, which was transported down in a blizzard. All three boats were heading to get fixed up and “Halcyonized” at Waterline Systems and New England Boatworks in Rhode Island. They would all look alike and be fitted with 42-inch bowsprits for asymmetric spinnakers. We agreed that this would make spinnaker handling a lot easier and safer for less experienced clients. We secured a commercial lease in TriBeCa for a nice loft space and hired two employees. Our team was now four. I’m originally from Brooklyn, learned to sail on the North Shore of Long Island, sailed at Stanford University, and worked in financial consulting for four years. Simon is a former Danish 49er Olympic team member, MBA student, and former Maersk (Danish shipping giant) employee. Ben Whitman is a committed racer, St Mary’s graduate and community sailing organizer, and CC Childers is a Southern California skiff sailor and merchant mariner. The Halcyon team hustled to put hardware on our three boats and get them ready to sail. Our drill “Makita” has more hours on it than most, we have applied countless tubes of sealant (or goo), and spent hours in a boat with a chain-smoking mechanic to fire up a bum engine. We built three nice maple tables for our loft. We even experienced a weeklong shortage of quarter-inch diameter nuts on the East Coast. Don’t ask me how, but my theory is that somewhere in the Chelsea neighborhood of Manhattan there was an art installation consisting of a great collection of quarter-inch marine-grade nuts. In early May, we had all three boats floating and were testing and training. Now we are open for business and offer three core products: Group Racing events, Lessons/Cruises, and Club Racing. 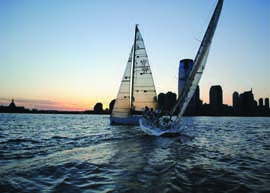 We are offering the most exciting and interactive sailing events and cruises in Manhattan. We are not lobster rolls and champagne flutes – we offer something more fulfilling. When you come off our boats, you will have done something that few get the chance to experience: a thrilling adventure sailing off Manhattan. And the skyline looks great from a Halcyon boat! Then back at the loft we pull out the champagne. Our group event rests on the principle that people want a fantastic sailing experience. 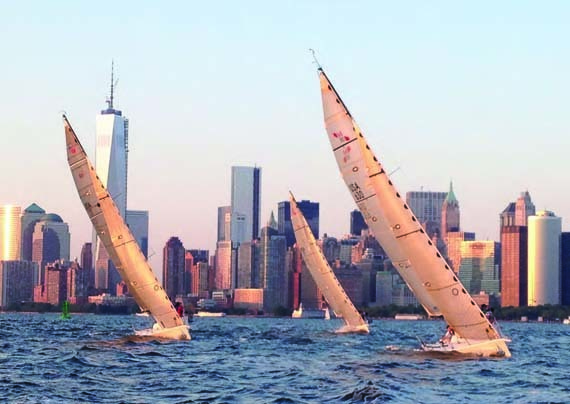 Halcyon’s corporate event is the result of collaboration among the Royal Danish Yacht Club, New York leadership consultants, and Halcyon’s staff and mentors. A successful boat requires a cohesive and energetic crew. Sailing encourages the best communication techniques and a heightened level of understanding among individuals. No matter whether they win or lose a race, every crew will test their group dynamic to better exploit the wind, weather, and waves. Our loft is a place where a corporate group can consolidate the lesson or message of change that was developed out on the water. Our racing league is coming together as we draw good racers from their dens in the towering buildings that surround us in Manhattan. We have had some close crosses and exciting surfing, right next to the Statue of Liberty! To learn more about Halcyon Sailing, visit halcyonsailing.com. We look forward to expanding our fleet and continuing to attract enthusiastic sailors to TriBeCa!